Holiday memories alive and … fragrant! 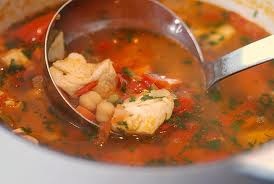 Babbie Guscio, Bluffton Bouillabaisse is one of those holiday memories that is alive and fragrant. Recipe first appeared in The Bluffton Packet. 843-757-3855. 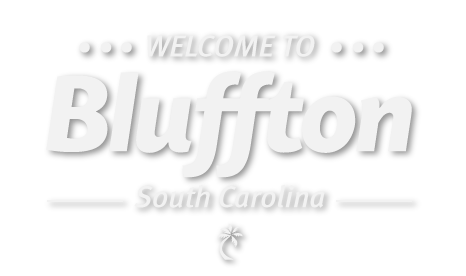 Better Banking now in Bluffton! 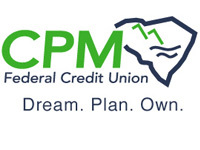 CPM Federal Credit Union is a not-for-profit financial institution founded in 1955 by employees of the Charleston Paper Mill in Charleston, SC. We have grown to span across the state of South Carolina with 11 branches, serving over 56,000 members and $350 million in assets. Our mission is simple. Provide low fees, low rates and affordable banking services that others can’t or won’t. Come let us show you why CPM truly is Better Banking because to us…. Carolina PeopleMatter! For many couples, it wouldn’t be Valentine’s Day without the traditional red wine and decadent dark chocolates. But did you know that there are many heart-healthy benefits that go along with delicious icons of romance? So when you’re enjoying that toast with your sweetie this year, be sure to raise your glass to everything they do for you. The hardest working compound in wine, resveratrol, decreases LDL (the “bad” cholesterol). Meanwhile, the ethanol alcohol in wine improves your HDL (the “good” cholesterol). It’s easy to convince yourself that a glass of wine a day—defined by the United States Dietary Guidelines 2015 to 2020 as 5 oz.—is all you need to keep the doctor away. However, you still need a healthy diet and regular exercise. It’s wine, not ambrosia. At first glance, the high calorie-count and the saturated and unsaturated fats in chocolate may not look good for your heart. The darker the chocolate, the more flavonoids it will contain. Those flavonoids help lower LDL cholesterol levels while raising HDL cholesterol levels. Still, you’ll want to indulge in moderation to avoid excessive sugar consumption. Resveratrol does much more than affect your cholesterol levels. It’s also the compound that makes you feel relaxed by lowering your blood pressure. At the same time, resveratrol boosts the omega-3 in plasma and red blood cells, making them less sticky and prone to clotting, and activates a protein that works as an anti-aging agent. 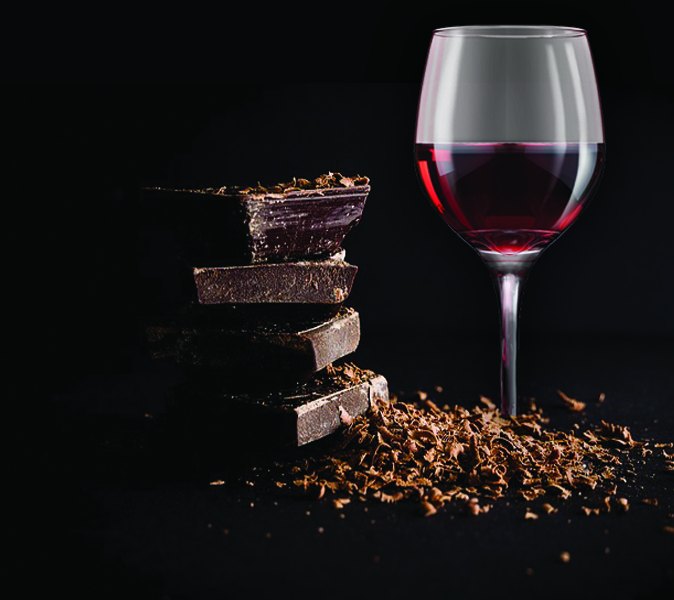 While wine has a stronger impact on lowering blood pressure, chocolate isn’t slacking off here. The flavanols in dark chocolate help stimulate and relax the lining of the arteries, lowering resistance to blood flow. It probably won’t do much good if you have dangerously high blood pressure, but who isn’t relaxed even a teeny bit by a bite of chocolate? Red wine and chocolate are often praised for their antioxidants, joining the ranks of “superfoods” we happily consume, but have little to no idea what they do for us. That’s O.K. ; all the free radical-fighting action is happening on a molecular level anyway. A free radical is a molecule with an unbonded electron, making it unstable and highly reactive around neighboring molecules. That reaction is what causes cell damage. It’s like when one child in the back seat gets bored and starts a game of “I’m Not Touching You” with the others. An antioxidant is a stable molecule that donates an electron to the free radical molecule and neutralizes it. This would be like telling the kids you will turn this car around if they don’t knock it off right now. Whether the free radicals are rampaging around your molecules or just your back seat, a glass of wine or a bite of chocolate could do you some good. If you’re getting your antioxidant bump from chocolate, remember that darker is better. Unprocessed cocoa beans contain loads of antioxidants that get stripped in the refining process. Also, manufactured chocolate has sugar added. Too much sugar will outweigh any other nutritional benefits, so keep an eye out for chocolates with 70% or higher cocoa content. When adding antioxidant-rich items to your diet, the Mayo Clinic advises that you not focus on one food or food group. Incorporate fruits, vegetables, nuts and legumes into your diet to get the most out of your antioxidants. Red wine has a solid record of reducing harmful bacteria in the mouth and the rest of your body. It helps remove dangerous chemicals in red meat, aiding in digestion and preventing food poisoning. So, if you happen to reach for the steak tartar hors d’oeuvres one night, unaware or unafraid of what you’re about to eat, a glass of red wine could help make sure your evening remains pleasant. As strange as it sounds, dark chocolate can do your teeth some good. We all know that sugar promotes dental decay. Thankfully, since you’re now buying really dark chocolate that contains less sugar, you can help ward off cavities while satisfying your sweet tooth. The theobromine in chocolate actually strengthens tooth enamel, which is a nice added benefit. Remember to get the good stuff: 70% or higher cocoa content. Steer clear of sweet dessert wines—which have a higher calorie count due to their sugar content—and opt for something with more health benefits, such as a Cabernet Sauvignon. Enjoy this Valentine’s Day and many more by indulging in a healthy holiday tradition. The Cranberry Mule is a holiday take on the popular Moscow Mule. It is a perfect seasonal cocktail for a Christmas get together. 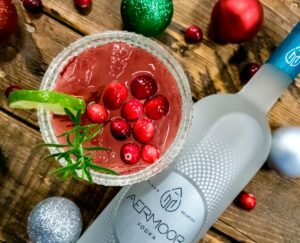 Combine Aermoor Vodka and cranberry juice in a shaker full of ice. Shake, then pour over ice. Top off with ginger beer, add lime juice to taste and stir gently. Serve with fresh cranberries, lime and a sprig of rosemary for garnish. Watch it blow peoples’ minds. Please enjoy responsibly. Hilton Head Distillery is a registered trademark. © 2018 Hilton Head Distillery.